Taking Flight, an inspiring temporary installation made up of 5,000 ceramic butterflies will take centre stage at Trentham Gardens from late May until early November, and each intricately made butterfly will be available to buy with all funds raised benefitting The Donna Louise Hospice for Children & Young People. A poignant video can be seen here, featuring Charlotte’s grandmother Jenny Thom and her butterfly paintings – https://youtu.be/joTZP5UwYAs. The butterflies are now on sale, please go on line to www.thebutterflies.org.uk, each purchase includes one free day admission to Trentham Gardens, to view “Taking Flight” from the 25 May to 3 November 2019. “The vibrant blue butterflies have then been glazed and finished to the highest standard by the world-renowned Wade Ceramics pottery in the heart of Stoke-on-Trent. 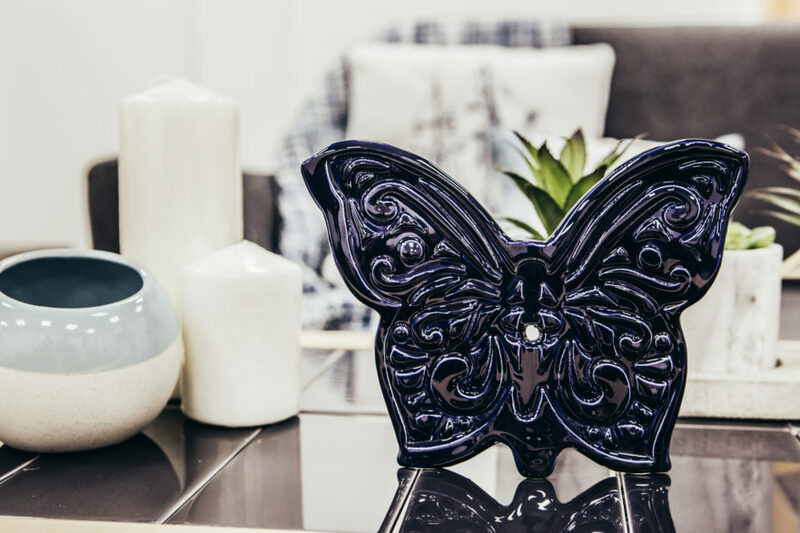 These strictly limited-edition butterflies represent the finest artistry and expertise of The Potteries and are truly unique. Notes to Editors: The Butterflies is a unique collaboration of local businesses, the cultural, tourism and education sectors along with individuals with a single shared vision; to ensure those in the care of The Donna Louise Hospice for Children & Young People enjoy the best possible life. These are Tile Mountain (main sponsor), Johnson Tiles, Wade Ceramics, KMF, Valentine Clays, The Trentham Estate, PM Training, Advanced Packaging, Strategi Solutions, Miller and Co., Inspired Film and Video, Joanne Hine, Campbell Creative Consulting, Staffordshire University, Paul Williams, Stoke-on-Trent City Council, DPD, Red Industries, My Clever Group, QPS, Gladman Developments, Blakemans’ , Rydale Roofing, Franklyn Financial Management, Holdcroft Heating, Envisage.